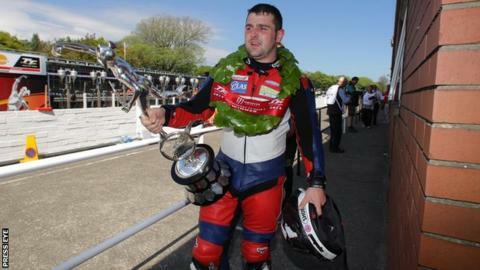 Michael Dunlop says he will sit out the 2014 road racing season if a suitable offer of competitive machinery is not forthcoming in the near future. Honda manager Neil Tuxworth recently revealed that Dunlop would not be riding for the Japanese manufacturer. "I haven't signed any deals for 2014, mainly due to various complications attached to each offer put to me," said the 24-year-old in a statement. "Sadly at this moment in time I will not be racing next year," he added. Dunlop won four TT races on the Isle of Man this year to take his overall tally to seven over the famous Mountain Course. He also clocked up victories at the North West 200 and Ulster Grand Prix, but is understood to have recently been contemplating taking a year out of the sport. "There has been much speculation about my plans for next year and I have decided to let all my loyal sponsors, team members and fans know exactly where I am at currently," explained Dunlop. "I am disappointed to be in this situation, especially after the tremendous season I enjoyed in 2013 and the success I achieved. "However, I am as keen as ever to race motorbikes and if something materialises I might consider coming back if I am ready and it's the right package. If not, I hope to be back in 2015, or if not 2016. "I have worked extremely hard to get to this level in road racing and unless I feel I have the right equipment and structure under me I won't race at all." Dunlop has also been linked with the Milwaukee Yamaha team, but they are understood to be now planning to run just two riders at the international road races next year - Ian Hutchinson and Josh Brookes. Earlier this month, Tuxworth outlined that the Honda racing team had been unable to agree terms with Dunlop to ride for the team in 2014. "We put two or three deals to Michael but he turned them all down," Tuxworth told Motorcycle News. "Michael will not be with Honda next year. That is 100%. He decided that he didn't want to stay with Honda," added the Honda chief.